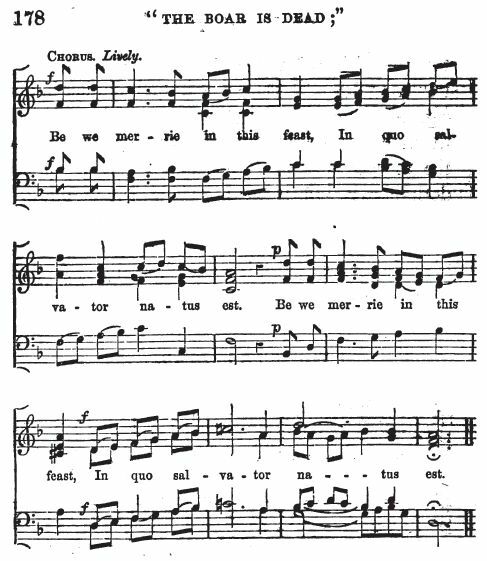 This carol was sung, in 1607, at the ceremony of bringing in the Boar's Head before the Christmas Prince, a kind of Lord of Misrule, or Master of Revels, formerly annually elected from amongst the juniors of St. John the Baptist's College, Oxford, to preside during the Christmas holidays. This custom had prevailed in other Oxford colleges, particularly in Merton College, before the Reformation, when it was abolished. In the Societies of the Law, particularly Gray's Inn and the Temple, it continued long afterwards. "At a Christmas celebrated in the Hall of the Middle Temple, in the year 1635, the jurisdiction, privileges, and parade of this mock monarch are thus circumstantially described. He was attended by his Lord Keeper, Lord Treasurer, with eight white slaves, a captain of his Band of Pensioners, and of his Guard; and with two chaplains, who were so seriously impressed with an idea of his regal dignity, that when they preached before him on the preceding Sunday in the Temple Church, on ascending the pulpit they saluted him with three low bows. He dined, both in the Hall and in his privy chamber, under a cloth of estate. The pole-axes for his Gentlemen Pensioners were borrowed of Lord Salisbury. Lord Holland, his temporary Justice in Eyre, supplies him with venison on demand; and the Lord Mayor and Sheriffs of London with wine. On Twelfth Day, at going to church, he received many petitions, which he gave to his Master of Requests: and, like other kings, he had a favourite, whom, with others, gentlemen of high quality, he knighted as returning from church. (The satire conveyed in this last action, was, doubtless, keenly relished at the time.) His expenses, all from his own purse, amounted to two thousand pounds." The roguish mustard, dangerous to the nose. Porridge with plums, and turkies with the chine." This Carol is the Christmas grace sung before Prince Henry, at St. John's College, Oxford, in 1607. The second verse would appear to give countenance to the pagan origin of our Christmas observances. 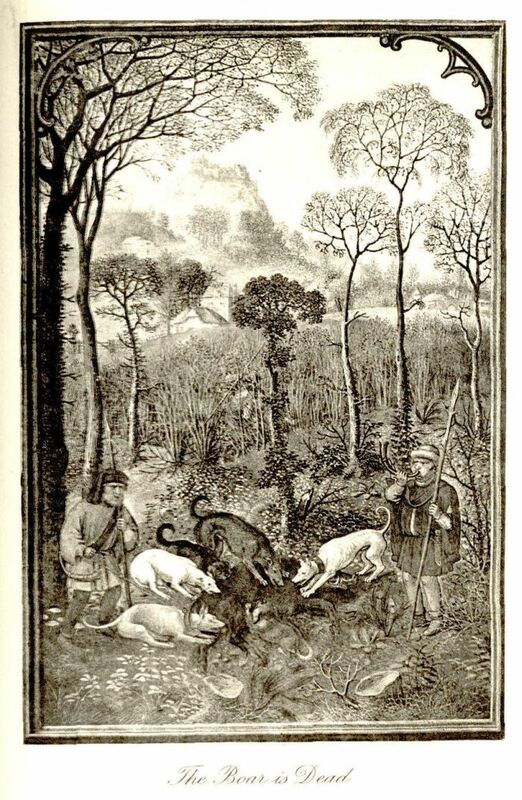 The mention of Meleager in the first verse refers to the hero who slaughtered the famous old Calydonian Boar. The carol collections of William Sandys (1833) and Thomas Wright (1841) both have the note: "Carol, on bringing the Boar's Head, used before the Christmas Prince, at St. John the Baptist's College, Oxford, Christmas 1607." Sylvester gives us the name of "the Christmas Prince:" Prince Henry (1594–1612), the beloved eldest son of James I. Henry died of typhoid fever on November 6, 1612, "to the great grief of the whole nation," and was buried in Westminster Abbey. His younger brother, Charles I, came to the throne on the death of James I in 1625; Charles was executed in 1649 during the English Civil War. The victory of Cromwell and the Puritans marked the death of the public observance of Christmas in England until after the Restoration of the monarchy in 1660. The reference to "Ceres" in Verse 2 is to the Roman goddess of agriculture, grain crops, fertility and motherly relationships. Also found in Edith Rickert, Ancient English Christmas Carols: 1400-1700 (London: Chatto & Windus, 1914), p. 260. Rickert cites The Christmas Prince, as given at St. John's College, Oxford. Also found in A. H. Bullen, A Christmas Garland (London: John C. Nimmo, 1885), p. 172, with the note "From the Christmas Prince, 1607 (printed in 1814)." 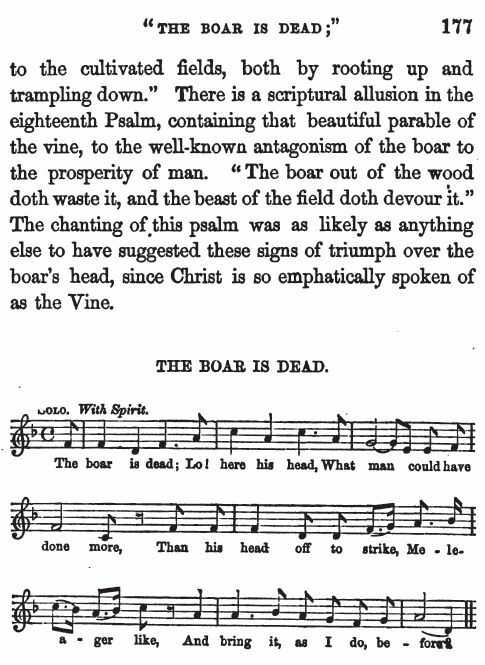 Also found in Henry Vizetelly, Christmas With The Poets (London: David Bogue, 1851), who notes "The annexed is the only Carol on bringing in the Boar's Head that belongs to the era of Elizabeth and her successor James I. He was used before the Christmas Prince at St. John the Baptist's College, Oxford, in 1607."